Home / Products / Seasonal / Easter Sugar Free / x-Sugar Free Milk Vanilla Butter Cream Egg, 4 oz. No need to sacrifice taste this Easter!! 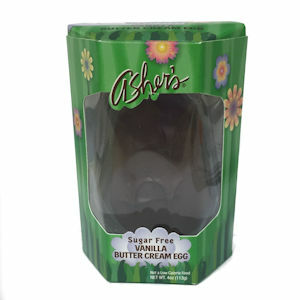 Our sugar free eggs have exceptional flavor and are perfect for Easter baskets. Sorbitol, Maltitol, Unsalted Butter (milk), Cocoa Butter, Chocolate Liquor, Milk, Modified Tapioca Starch, Calcium Caseinate (milk), Contains 1% of less of the following: Milk Fat, Natural & Artificial Vanilla Flavor, Soya Lecithin (an emulsifier), Cellulose Gel, Cellulose Gum, Natural Butter Flavor, BHA (an antioxidant), Corn Oil.